It is still common for certain items to have postage guaranteed for return but I'm not sure the post office will deliver such things anymore. 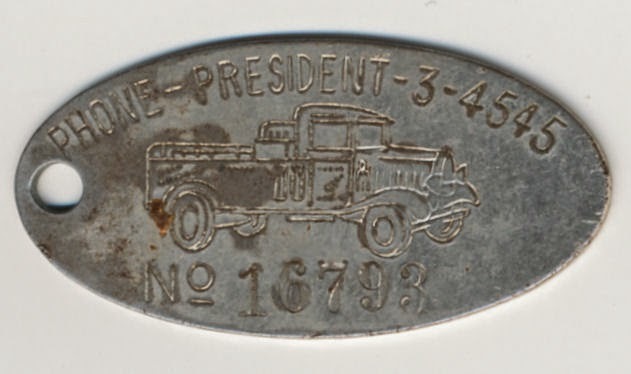 The phone number is for AGS HQ, which we know from the matchbooks I have shown here previously was at 1619 Bedford Avenue, Brooklyn, a mere block-and-a-half from the rightfield wall at Ebbets Field. I have to scour some old ballpark photos to see if the HQ shows up at all. It's actually a charge coin, which if you click the charge plate link above, basically dates to just after the end of the Civil War. The truck was called their "Trouble Shooter" by the way. If that is a running count of AGS charge customers, it's impressive! Extra! Extra! Gee, I've always wanted to say that....and now thanks to a recent arrival here at the main Topps Archives Research Complex I can. 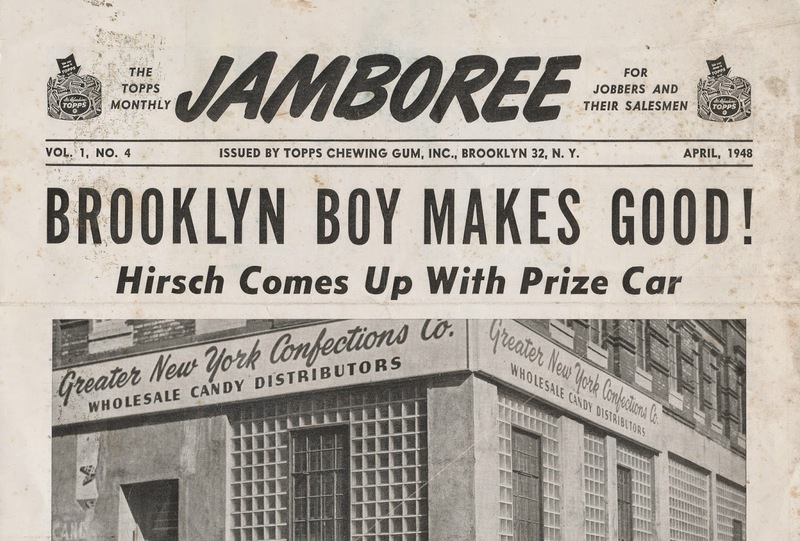 I gather Jamboree was also the name of their sales competition. The whole issue was folded three times and a few copies were likely thrown in with each jobbers orders. I find the whole Topps sales incentive program fascinating and illustrative of how hard they pushed their reps and customers to move product.. I am pretty sure Topps also had an internal house organ for their employees but I have not yet seen a copy. While I was researching my Modern Hobby Guide material two or three years ago, I found a funny thing. 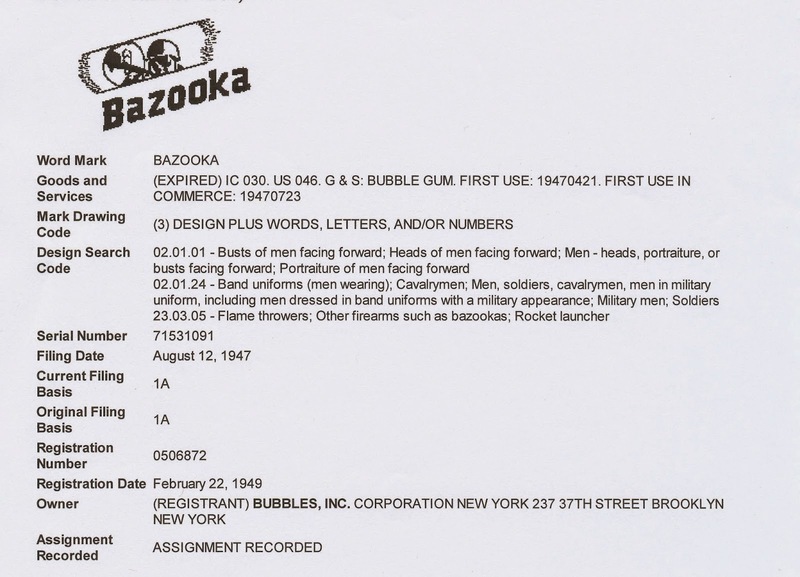 There was a trademark registered by Bubbles Inc. (later assigned to Topps) for Bazooka that indicated the first appearance of this iconic bubble gum occurred on July 12, 1938. This is additional information from the US Government database of Patents and Trademarks and it confirms the previous application was successful. 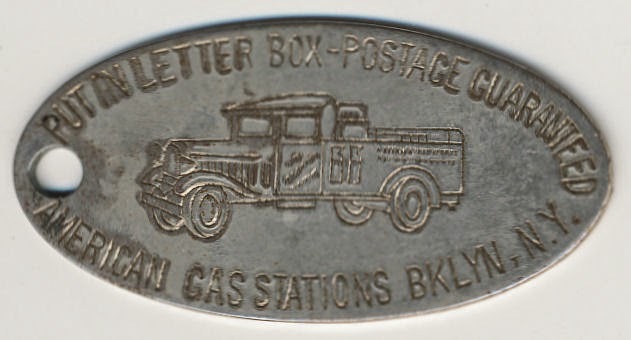 First use on April 21, 1947 would have been locally in New York City; the July 23, 1947 date marks the first time it was used in Interstate commerce. 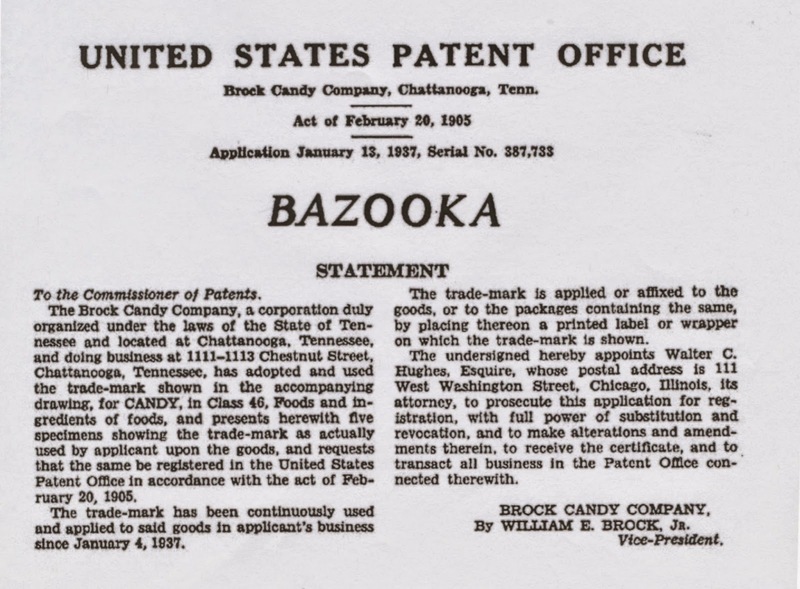 Brock Candy (once briefly discussed here in connection with the trademark) was a fixture in the Chattanooga confectionery business at the time of this filing and that city figures prominently in the history of Topps as they bought another concern there called Bennett-Hubbard in 1943 and turned it into their southern plant before it was closed up in 1951. Chattanooga was also quite close to Fort Ogelthorpe, Georgia where Phil Shorin, a Topps founder, was stationed during World War 1 and would have been a prime recreational area when on leave from the base. 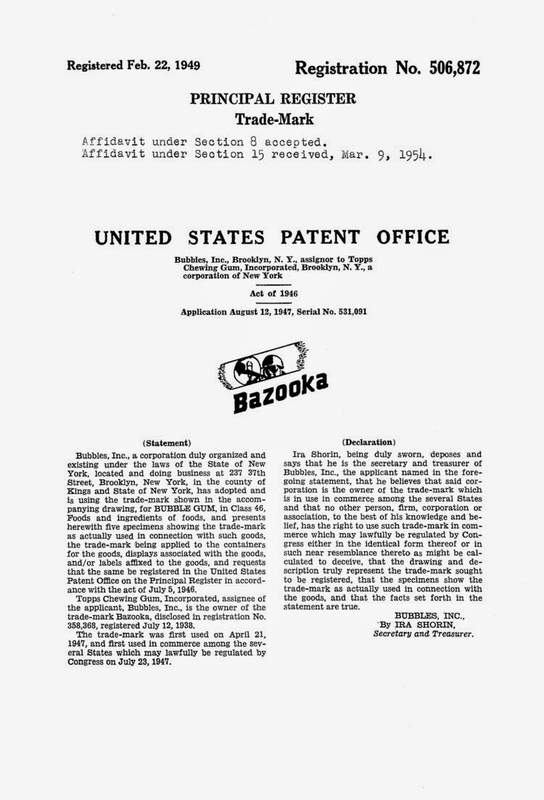 Bazooka as can be plainly seen, was used locally starting on January 4, 1937. 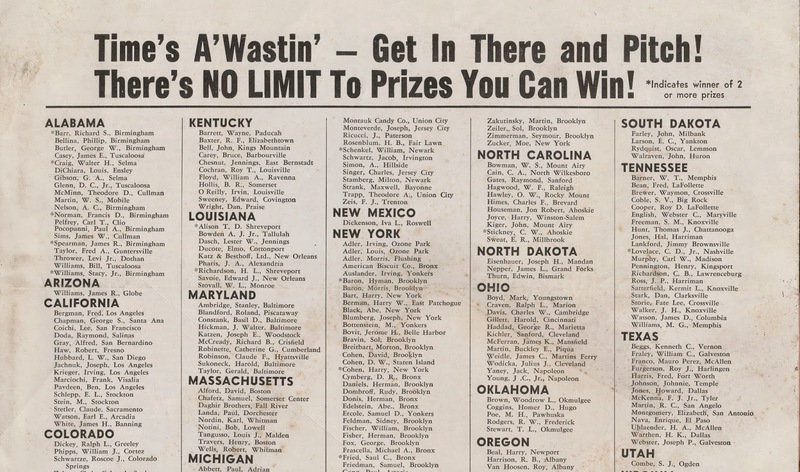 I can't find the one linking document (not all old records are digitized) but I suspect Topps. 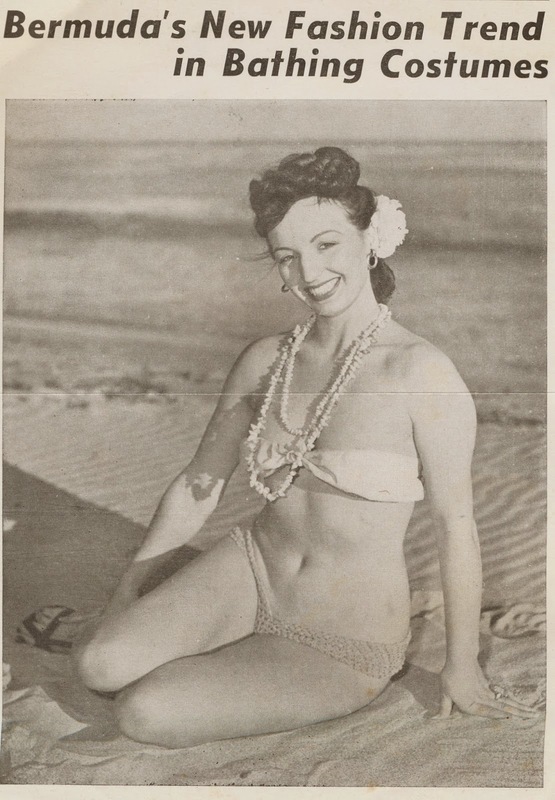 bought the brand name at some point from Brock through Bubbles Inc. sometime in early 1947. 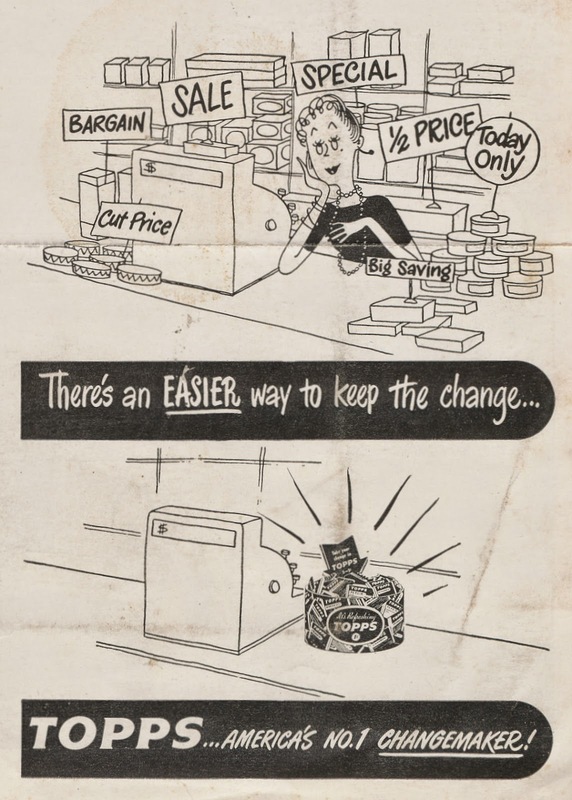 Brock was paying back a payroll loan at the time and I am thinking the brand was not in use after the war. I can't prove it but it makes a lot of sense and there is no way the Chattanooga connection is a coincidence, as there are no coincidences when it comes to the Shorin family and their businesses. 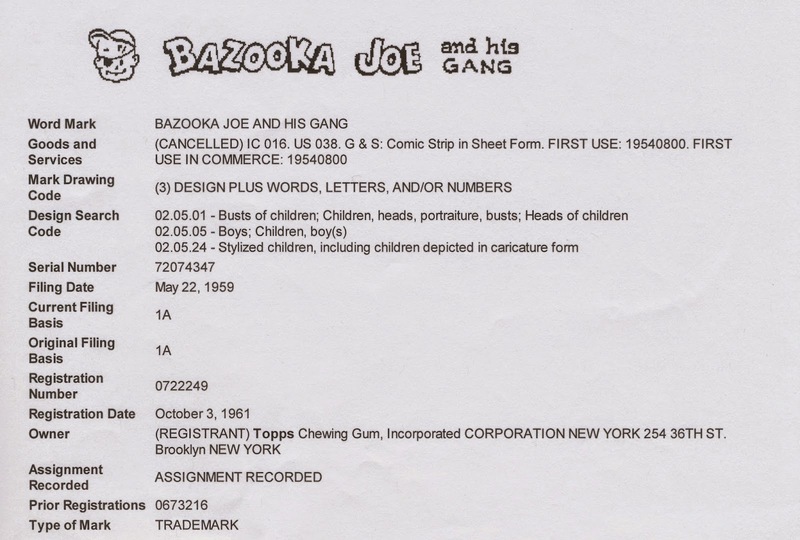 This dates Joe and the gang to August 1954, although BFF o'the Archive Jeff Shepherd feels it was a few months earlier. One of the things I can't get a firm grip on is when Ben Solomon, longtime Topps Art Director, and Woody Gelman, their longtime Creative Director, joined the company. Both men had worked together since the late 1930's, when Ben was an animator at Fleischer Studios and Woody an aspiring assistant. 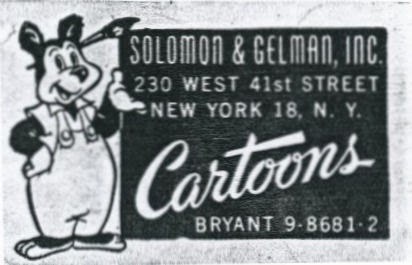 After their stint at Fleischer's, where Ben made his mark directing Popeye shorts, the immediate postwar years found them in an art agency named, prosaically enough, Solomon & Gelman. 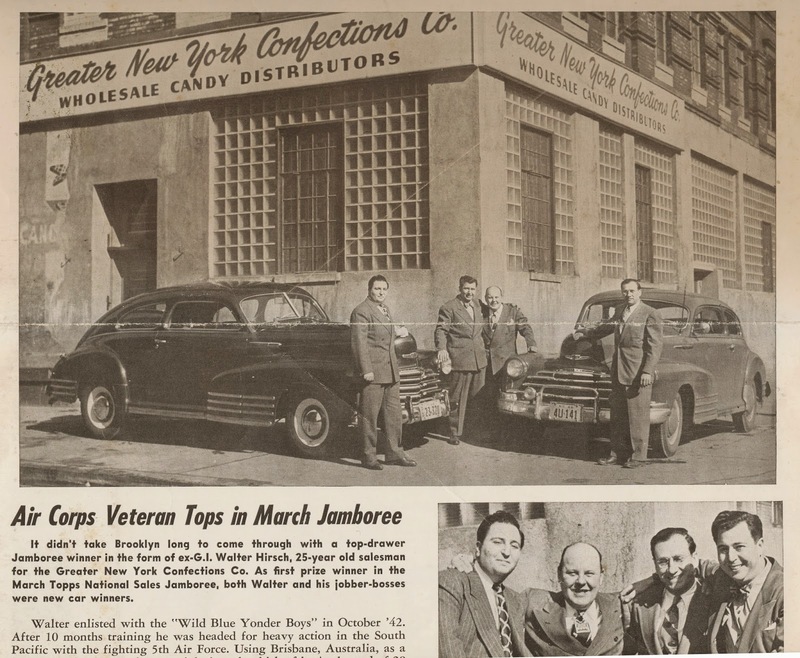 Here they did high quality work in the decade before photography took over the advertising world and their work on a campaign for Popsicles got the attention of Topps President Joseph Shorin around 1950-51. 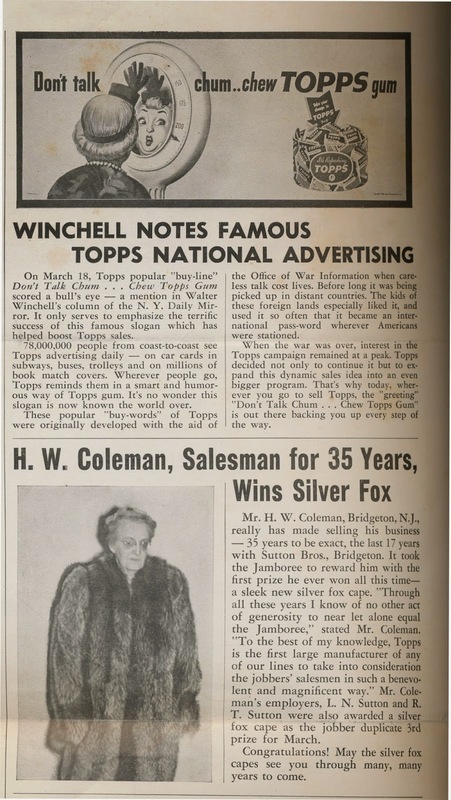 After doing some work for Topps, Shorin allegedly told the two that unless they came to work for him, he would give all his work to another agency. I think Woody came into the fold first; he worked with Sy Berger (at Sy's apartment) in late 1951 on the iconic 1952 Topps set, which was critical to the firm's future and I have seen references he was working in their offices by 1953. 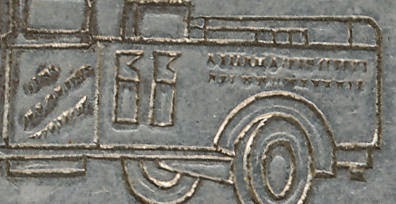 Ben however, is harder to trace and may not have been full time at Topps until the early 1960's. It's also possible Solomon & Gelman was brought in house and allowed to retain some autonomy so long as their work did not interfere with their jobs at Topps. 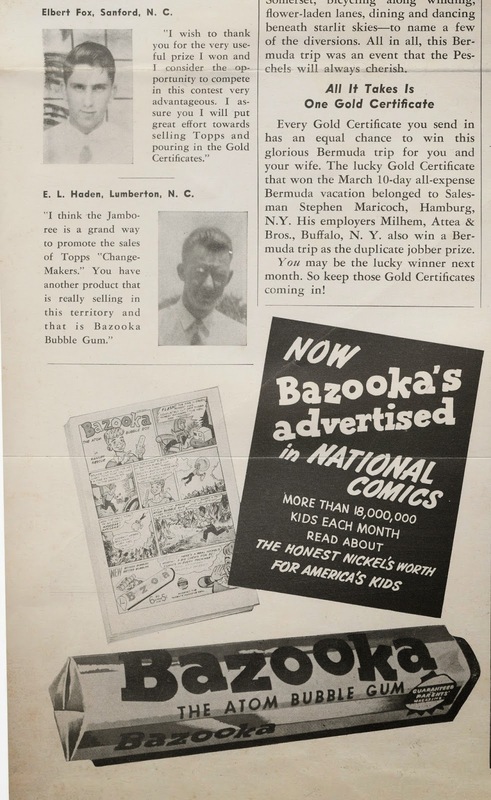 That approved reading logo is a bit frightening and likely was due to the imposition of the Comics Code Authority in 1954-55; many publishers would have to adapt due to the changes occurring in what could be sold to America's youth following a series of Congressional hearings. 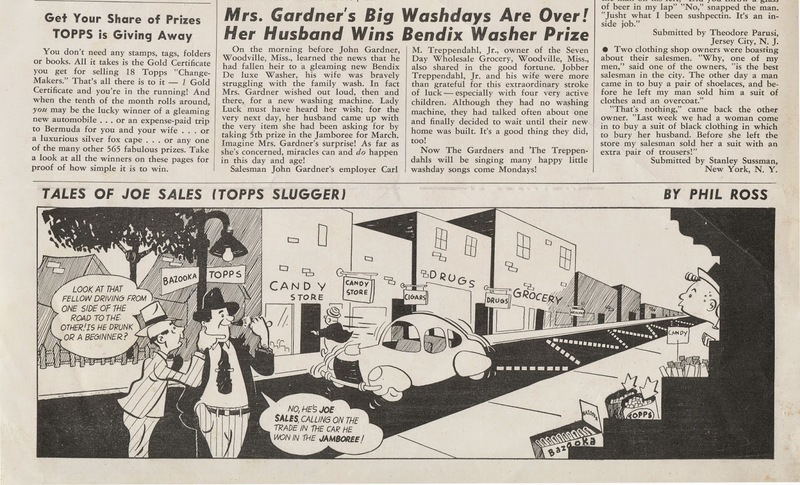 The CCC gave us Mad Magazine but in reality was just a bunch of hooey that disrupted many livelihoods. Nat Wilson may have been a pen name for Ben & Woody; I'm not 100% sure of that but another author in the series, Arthur Benwood, has a name that is clearly derived from an amalgram of Ben and Woody's first names. Topps would issue two fan magazines in 1965 that took some inspiration from Triple Nickel Books but I think the series ended in 1957. Ben & Woody however, had greater days ahead at Topps.